We can tell you how replacing your windows and doors or adding insulation can help you save on your energy bills. It’s another thing to tell you how much it will help raise your home value if you’re in the market for selling your home and want the most for it! The Sacramento housing market has had it’s ups and downs, and we can help you with so many of the most recommended home improvement projects to take care of before putting your house on the market! Before you consider cosmetic and even functional improvements (such as adding additional square footage) to the home, make all needed upgrades, repairs or replacements to the home’s major systems. Major systems include plumbing, heating, electrical and sewer systems, among others. Buyers want assurance that these basic items are in working order and won’t need to be replaced or repaired in the near future, an issue that will most likely be addressed in the home inspection. Older homes may require updated wiring and plumbing. An old roof should be replaced. Address problems with heating and air-conditioning units. Replacement projects will give you more added value than remodeling projects, according to Remodeling Magazine. Fortunately for homeowners, these types of projects are also the least expensive and add to the home’s curb appeal. Consider replacing the garage door, siding, the front door and windows. The average return on investment for these projects is almost 72 percent. The ROI on replacing garage doors, siding, front doors and windows is almost 72%! The magazine suggests fiber-cement or foam-backed vinyl siding, adding a steel entry door, and vinyl window replacement. The number one home improvement project as far as recouping a return on your investment is the addition of an attic bedroom, according to Remodeling Magazine. At a nationwide average cost of a little over $50,000, expect to recoup 72.5 percent of the cost of adding the attic bedroom when you sell the home. Over the past few decades, the kitchen was the average homebuyer’s focal point when choosing a home. In 2011 bathrooms became more important to buyers than kitchens. That said, an additional bathroom, even a half bathroom, adds significant value to your home, according to the experts at the National Association of Home Builders (NAHB). A half bath may add up to 10.5 percent to a home’s value, while a full bath can tack on an additional 20 percent. Of course, the amount of additional value you will receive varies according to the home’s other features. The price of adding another bathroom to the house varies as well, depending on region. If you live on the West Coast, plan on paying almost $50,000 for a new bathroom, according to Remodeling Magazine. The magazine also states that, at the sale of the home, you’ll recoup almost 67 percent of the cost of the additional bedroom. East Coasters can plan on spending a bit less – around $41,000, but will recoup less as well – 47.7 percent of the cost. Tip: If you’re on a tight budget and can’t afford a bathroom addition, give the existing bathrooms a facelift. A fresh coat of paint, new fixtures and new flooring will add value and make the home show better. Kitchens tend to be the heart of a family home so anything you do to improve your kitchen will add value. Again, painting the kitchen should be the first step, whether you plan an entire remodel of the room or just a minor facelift. Vinyl flooring tends to make the room look dated, so consider replacing it with laminate or tile. New cabinetry, kitchen sink fixtures and updated lighting will all add value. Tip: Folks on a budget can still increase value by sanding and then painting or staining cabinetry and adding new hardware and by purchasing new (matching) appliances and new countertops. 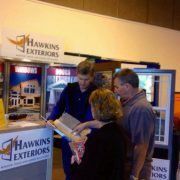 Ready for us to give you a FREE quote on your next home improvement project? The first step is clicking here and we’ll get back to you ASAP! Should You Add Insulation? Out and about: Our 2015 Show Schedule!